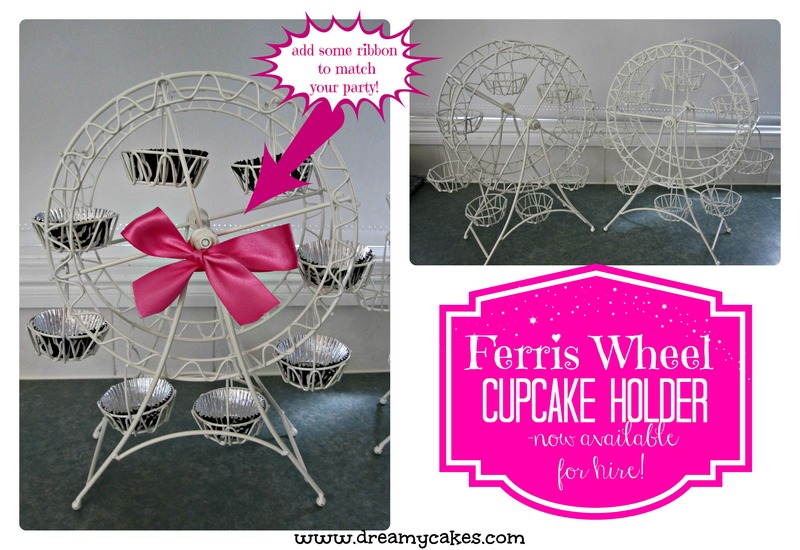 Cupcake Stand Hire - see our new cupcake stands! We have some cute new cake stands for hire! Cupcake stand hire available from Dreamy Cakes. Check out our new Carousel Cupcake Stands available for hire. 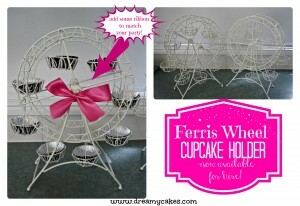 You can hire our cupcake carousels with or without a Dreamy Cakes order. Hire both of these cupcake stands for $25 (3 days hire) with a $60 security bond. Each stands holds 8 standard size cupcakes. The stands go round like a real Ferris Wheel – kid’s absolutely LOVE these. They are a fun addition to your party to display your cupcakes. The stands are white in colour so will suit any theme or colour scheme. Or you can add your own ribbon (see our picture) to match your party colours.